In one’s life good and bad things must come to an end which plays a vital role in job market. Being employed, the employees must be ready to satisfy their basic fundamentals such as living, clothing, shelter, food etc. To satisfy all these money plays a vital role in one’s life. Job can be considered as a piece of work that earns a person’s livelihood. Due to unforeseen circumstances and misfortunes, the person may remain quiet with confidence to get a better opportunity. It consists of certain duties, responsibilities and the completion of tasks etc. Being employed has become an overwhelming part of one’s career. Sometimes in the developed countries, employees are asked to work for hours together to complete the targets within the given deadlines which will cause stress in their minds. As the saying goes “money makes many things” proves right by being in job. Nowadays working environment has become fierce that might make the people sick of working long stressful hours and even with less income. More than thinking about the best income, one must gain knowledge about how to act in this present scenario and in this competitive world too. These people will have a mindset which makes them quit the job. 2. While applying for new position via application there will be an option for collecting information about the reason for leaving previous job. 3. Also, one must give a definite reason to the previous employer for leaving the respective job. During an interview the interviewer will ask so many interview questions about leaving a job or quitting your job. One must avoid being dishonest to the interviewer by telling improper reasons. Even after being selected for a new job, the person should be answerable to the manager and co-workers. If this new job is related only on money mindedness then the reputation may be spoiled. One must be ready to face everyone without giving improper excuses. The general fact is that in each interview if the applicant has mentioned about the experience, the interviewer for sure will raise a question asking him/her “Why did you leave your previous job?”. So if the applicant attracts the interviewer with his/her answer, then it will be better to get that job. 1. Was the job left for a proper reason? 2. Was the job left on making own decision or was forced to leave the job? 3. Have you left the job as a professional? If the applicant seems to be solid, impulsive, reliable or flighty, then the interviewer asks whether the job was accommodated by someone else. The interviewer will be mainly focusing on loyalty, responsibility, stability and reasons given by the applicant. They may also bother about whether the applicant is underutilized or inapplicable for that particular position. Sometimes, they will enquire about the outgrowth of skills and abilities of the applicant. 2. Was the job left on own decision or was forced to leave the job? The employer will support if the job has been left for a right reason. If the hiring manager comes to know that the job has been asked to leave due to non-performance, integrity issues or due to other unforeseen circumstances related issues then the hiring person will think twice before hiring. Didn’t you enjoy the work? Were you focusing on change of working environment? Are you in need of more money than the previous? The employer will like to figure out whether the applicant is an eligible candidate for the organization. The employer may sometimes personally contact the reference number attached in the curriculum vitae of the respective applicant. This process will help the hiring manager to cross check the applicant’s efficiency. Thus it is better if an applicant gives a proper reason for leaving the previous job. Everyone will have stressful days at work. It may be sometimes accompanied by frustration and bore in the workplace, which makes them think that they are in a miserable situation. Since they are more focused on building their career, they are reluctant towards the given work. Thus they search for a work that gives them feel of fulfilment at work. After leaving the job they will wait for the promotion or a good position as a professional adaptability and advancement in career is most important. There are many advantages and disadvantages in every company. It is one’s own capability to ruin it. There are lots of difference in the culture between a small sized or in a large company. It makes sense when every company does not follow the same culture. There are possibilities that the old company may vary in work culture from the new company in various ways. The size of the company must be taken into account just to verify whether it will be a proper place to work in. Does it have the same size as the previous company or it’s huge. Or, the applicant would prefer something called a medium sized company. There are more advantages and disadvantages in each and every enterprise which will help one to strengthen oneself. Usually large enterprises will make more offers and tend to give greater career opportunities to applicants. Smaller companies provide more innovative ideas even though the package is low. Everyone likes to be winner but the position is given to the person who works in a smart way. Each and every segment in the industry will be more creative and it would be more innovative for the person to understand the clear concepts and to explore new ideas. It will be good if the person concentrates more on the developmental stage of the company that tends to take the preference in career. Eventually a person can think about desire of his/her job. The applicant should enquire the other working employees of that particular organization about the salary and the benefits. Few things would be more disastrous if the issue with salary is not properly fixed. It is the applicant’s duty to determine what will be adequate assessment that one would fail to get. The management team of the company will strive the company from better to best in achieving goals. One should ensure that making current opportunities will help the person to reach out to his/her boss in case of emergencies. Even if there are some indirect harm one should be aware on focusing more into it and speak up frankly to the management and so the management will help in achieving a desired solution. The applicant should analyze the economic situations of the company. If the company sounds good in its economic footprints then it is really good. This means the company provides more career opportunities with economic sounds. Research should be done regarding stock prices. Reading annual reports and be satisfied with the current positions. People would like to sustain their work and life balance incase if there are some more challenging situations. It would likely regret the reasonable limit that will determine the job to be challenging in the job market. One must try to spend each and every hour with his/her family and friends which maintains the work balance. Nowadays it is not such an easy task to get job offers. There are no such companies that offer unlimited job offers. To reach a top grade within the organization one must focus on the internal career opportunities or sometimes through referrals. This career landscape can be built among the individual so that the company can reach the targeted results within the given deadline. While getting a new job opportunity one must verify whether it is a long term career opportunity or haves to migrate after few years. At the same time one must keep in mind that changing jobs after few years will affect the long term career prospects. It in turn will help in gaining more experience along with job security. Before accepting a job proposal, one must consider the job responsibility and description about the new role. It is incomparable to the new work line and eventually depending upon on the current role. Money does not matter for this but as a mankind every individual is in need of it. The company’s bottom line will be considered if incase it depends on the employees contributions. Everyone must consider their work as a valuable one and act as though it is appreciated by others. For it to be appreciated, one must work hard to attain it. It helps workers to feel more valuable and offers more opportunities for contribution towards the assigned task. One must have accommodated with the people working in the same environment. But when it comes to a new working environment one must think of how will the co workers treat? And also the respect gained for that position etc. Almost all the companies will give training to their employees at initial levels. It is the responsibility of the employee to understand the growth and performance to switch to different roles. Leaving job in a short period doesn’t mean that it’s a wise career move. Sometimes evaluating for a new job will help to attaining the targeted skills. 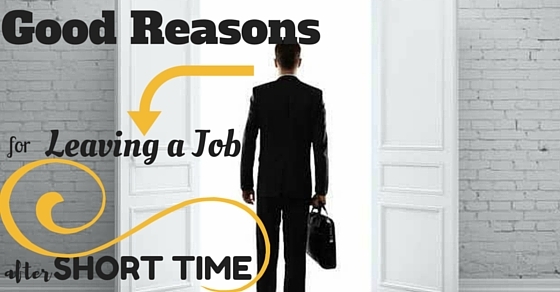 Here are few pros and cons of leaving a job. Employees who have long term positions will take up the responsibility to hire the applicants in which the applicant has to explain about the higher offers and his/her expectations about the job and the corresponding salary. e. Helps to concentrate on the future goals. g. Growth in career path. e. Questions will be raised based upon the skills and achievements. Thus the fact is, even though there are millions of women and men who tell that they are waiting for the right opportunity to opt of their career, the result will be failure. Because nowadays getting a job is difficult and one cannot wait until he/she gets a right opportunity. So it is better to gain experience and move to the job provided. Hence if a person is taking a quick move then he/she must be given a valid reason for leaving a job and to select a right career.